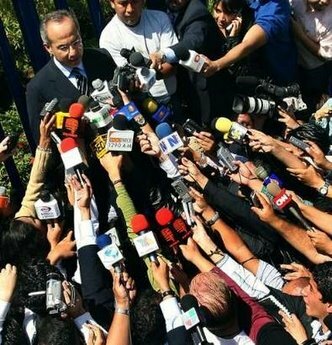 Exit polls have the presidential election between the more Conservative Felipe Calderon of the ruling party and Andres Manuel Lopez Obrador the Leftist candidate of Hugo Chavez locked in a tie. 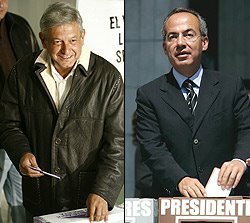 Newspaper exit polls said Felipe Calderon of the ruling party and Andres Manuel Lopez Obrador, the left-wing former mayor of Mexico City, were locked in such a tight race that it was impossible to declare a winner. It appeared that Roberto Madrazo of the Institutional Revolutionary Party, or PRI, which ruled Mexico for most of the 20th century was trailing in third place and was unlikely to win. The Federal Electoral Institute was expected to announce official results at around 11 p.m. (0400 GMT on Monday). If it is unable to call a winner, Mexico could face days or weeks of legal wrangling and protests similar to the fight that followed the U.S. presidential election in 2000. That would spook Mexico’s financial markets, which are already nervous about Lopez Obrador’s economic policies. Turnout was expected to be critical, and analysts said at least as many people could vote Sunday as did in 2000, when the figure was 65 percent. There are 71.3 million registered voters in this nation of about 107 million people. Voting was especially heavy in the states of Aguascalientes, Yucatán, Tabasco, México, Puebla and Veracruz, in addition to Mexico City, President Vicente Fox’s office said, quoting the Federal Electoral Institute, or IFE. There were few reports of major problems at the nation’s 130,000 polling places, 99.1 percent of which were functioning by mid-afternoon. Mexico currently exports $214 billion of oil a year, nearly 90 percent to United States. Among the 70 million people eligible to vote are thousands living across the border in the US, after a decision to allow Mexicans living abroad to vote for the first time. Try millions! There’s quite a difference between a thousand and a million in most circles. The estimated 11 million Mexicans living in the United States were allowed to vote from abroad for the first time, but the 32,632 ballots they cast weren’t likely to make much of a difference. …But, it is funny! 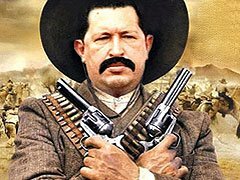 Hugo Chavez as the new Mexican Bandito, from the buildup to the election. Publius Pundit explains how Hugo Chavez became the biggest campaign issue in Mexico and has more here and here. Mark in Mexico is liveblogging from, er,… Mexico. Americans for Freedom has thoughts on what this means to the US and Mexico. Update: (12:30 AM CST) Wave Man provided a link to the real time results from Azteca. Calderon’s lead continues to shrink. Update: (8:30 PM CST) Good news for Mexico and the US, the conservative Caldaron is likey winner.